NOW UPDATED FOR THE 2011 VERSION OF SAGE 50! This step-by-step guide offers the latest guidance on using Sage 50 Accounts, the UK’s most popular small business accounting solution. From setting up and installing the software and creating your chart of accounts to invoicing customers, running VAT returns and producing monthly accounts; Sage 50 Accounts For Dummies will have you handling your own accounts efficiently – an profitably in no time. Jane Kelly, ACMA is a Chartered Management Accountant and Sage trainer. She writes the Sage Made Simple blog, which offers support for businesses using Sage accounting packages. Part I: Setting Up and Installing Sage 50 Accounts. 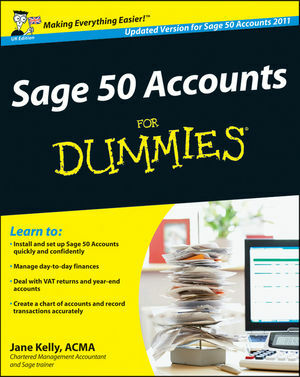 Chapter 1: Introducing Sage 50 Accounts. Chapter 2: Creating Your Chart of Accounts and Assigning Nominal Codes. Chapter 3: Setting up Records. Chapter 4: Recording Your Opening Balances. Part II: Looking into Day-to-Day Functions. Chapter 5: Processing Your Customer Paperwork. Chapter 6: Invoicing Your Customers. Chapter 7: Dealing with Paperwork from Your Suppliers. Chapter 8: Recording Your Bank Entries. Chapter 9: Maintaining and Correcting Entries. Part III: Functions for Plus and Professional Users. Chapter 10: Processing Sales Orders. Chapter 11: Processing Purchase Orders. Chapter 12: Keeping Track of Your Products. Chapter 14: Using Foreign Currencies. Part IV: Running Monthly, Quarterly and Annual Routines. Chapter 15: Reconciling Your Bank Accounts. Chapter 16: Running Your Monthly and Yearly Routines. Chapter 17: Running Your VAT Return. Chapter 18: Running Monthly Reports. Chapter 19: Tackling the Complicated Stuff. Chapter 20: Running Key Reports. Chapter 21: Ten (Okay, Eleven) Funky Functions. Chapter 22: Ten (Or More) Wizards to Conjure.